VIENNA - Austrians gathered in memory of the 6 million Jews murdered by the Nazis condemned plans to hold a ball of extreme rightists later in the day Friday, saying the event's timing transformed it into a macabre dance on Holocaust victims' graves. Friday is International Holocaust Remembrance Day, celebrated each year on the anniversary of the liberation of Auschwitz. Ball organizers insisted the fact that their event coincided this year with the 67th anniversary of the death camp's demise was coincidental and denied suggestions that those attending were extremists. But opponents vehemently criticized both the day chosen to hold the WKR ball and the political views of those attending it, suggesting it regularly attracts elements from the neo-Nazi fringe. The ball is to be held in Vienna's ornate Hofburg palace, less than a minute's walk away from the memorial event. The dispute reflects both the distance Austria has come in acknowledging its role in Nazi atrocities and stubborn rightist sentiment among some here, who see themselves as Germans and Germans as the superior race  a common regional building block of anti-Semitism. Some of the most bitter comments came from the crowd that converged on Vienna's Heldenplatz, or Heroes' Square, to lay wreaths for the victims of the Holocaust. "You, who will dance and celebrate here; we remind you of the murder of two-thirds of Europe's Jews," proclaimed death camp survivor Rudolf Gelbard. Insisting that Nazi atrocities must never be forgotten, Greens' Party head Eva Glawischnig declared, "It is all the greater perfidy that there will be dancing today on the graves of Auschwitz." Organizers point out that the ball traditionally takes place on the last Friday in January, but federal government minister Gabrielle Heinisch-Hosek scoffed at their insistence that the timing this year with international Holocaust commemorations was coincidence. She called the timing "a big provocation" in comments to The Associated Press, while Greens' Party member Niki Kunrath said the fact "that right-wing extremists can still assemble in the most magnificent halls of the country" was a national shame. Formally, Austria has moved from a postwar portrayal of being Nazi Germany's first victim to acknowledging that it was Hitler's willing partner. Most young Austrians reject Nazi ideology and condemn the part their parents might have played in the Holocaust. At the same time, the rightist-populist Freedom Party  whose supporters range from those disillusioned with the more traditional parties to Islamophobes and Holocaust deniers  has become Austria's second-strongest political force. The party, a strong defender of the ball, confirmed Friday that Marine Le Pen, head of France's National Front, planned to attend the event, along with Belgium's Philip Claeys of the Vlaams Belang party and other European far rightists. The Freedom Party itself went on the offensive, saying the real threat to society came from leftists planning to demonstrate against the ball and warning Austrian Jewish leader Ariel Muzicant that it might press charges of incitement against him for encouraging the protests. The ball is staged mostly by dueling fraternities including far-right members who display saber scars on their cheeks as badges of honor and mix on the dance floor with other guests of various ideological hues. Freedom Party leader Heinz-Christian Strache described the event as "an academic ball, not a political ball." He accused "extreme-left" opponents of trying to sabotage his party and warned that the protests being organized outside the venue were being organized by anarchists backing "the rule of the street." 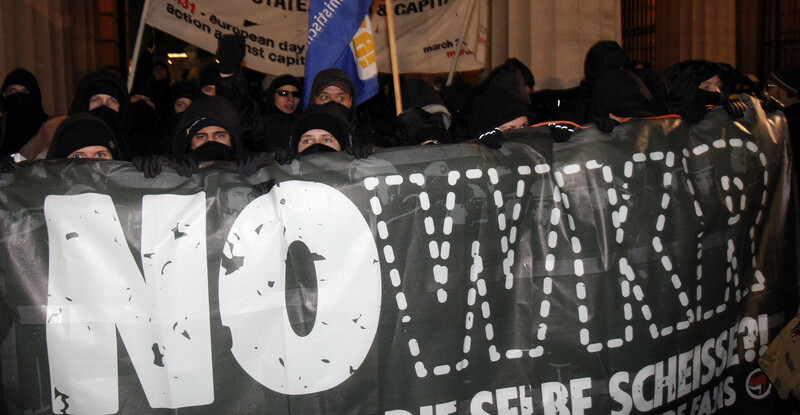 But demonstrations that began as the ball guests started to converge on the Hofburg were generally peaceful, with most of the approximately 2,500 demonstrators respecting police lines separating them from the venue. In the only reported incident, some of the guests were delayed when the two buses carrying them were briefly blocked by sitting protesters who were quickly removed by police. "I find this is wrong because today is the liberation day of Auschwitz," said demostrator Michael Wolfram of the event. "And I think it's impudent that the right-wing fraternities chose this day to celebrate." Because it was listed among other annual champagne-laced Viennese balls, an Austrian committee reporting to UNESCO, the U.N.'s culture organization, struck all the balls from its list of Austria's noteworthy traditions last week. While some of the more opulent Vienna balls are criticized as a showcase of the rich, most are devoid of direct political controversy. For centuries, the city's high society has waltzed blissfully through wars, recessions and occasional firebomb-throwing anarchists opposed to the moneyed decadence they think such events represent. But the WKR ball started drawing flack as Austrians began to come to grips decades ago with the fact that their country was one of Nazi Germany's most willing allies instead of its first victim through its 1938 annexation by Hitler. Bowing to the pressure, the Hofburg palace announced late last year that the ball will have to move elsewhere as of 2013.